standing with confidence, performing their pieces inspired by the heritage of the Dales and Char! We can't wait to share the material they produced with our visitors and the artists and craftspeople working on our trail project." I worked with The Dales Countryside Museum in Hawes, Wensleydale for the Yorkshire Dales National Park - we developed a sculpture trail around the museum. I worked with kids from the local primary school, and also residents from the local sheltered housing development, to produce poetry about the 8 different locations and themes of the sculptures. It was great fun, and lovely to work in such a beautiful museum with such ace staff: Fiona and Debbie are real stars and have been working at the museum for decades now. And my mother-in-law regularly gave cookery demo's there cos all Janina's (Yorkshire) side of the family come from good Wensleydale farming stock. So, this really is keeping it in the family! The local kids are a splendid bunch and have come up with some beautiful poems - see below for a sample from Libby. Debbie Allen (2nd in command at the museum) says about this project: "Char came to work with our country kids from the local school and somehow I thought they wouldn't engage - how wrong could I be? - she inspired them, and they RAN with it all !!" And the residents at the superb Sycamore Hall (definitely the best care home I've ever visited!) 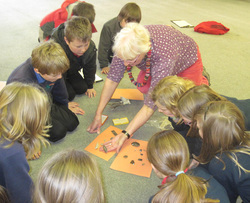 have been brilliant fun to work with, and to record their memories and ideas. 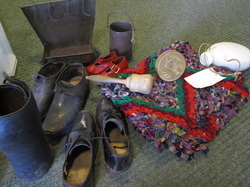 The photo above shows some of the museum's objects that the residents were telling me all about using when they were little. The Museum has integrated QR codes into each sculpture, so visitors can use their i-phones to see and/or hear the poetry that the residents and children have generated. BOGOF (buy one get one free) offer on flints! Amazing flint stone, no cave is complete with out it! Also Animal fur you will be the height of fashion. and make them your prey.